So far, I’ve been searching for the ultimate moist soft cake recipes for my decorating projects. 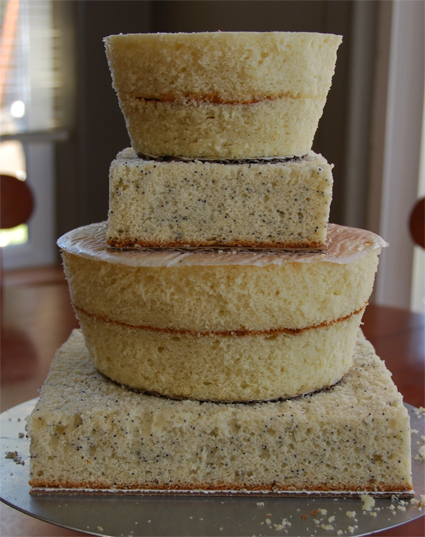 This cake exemplified why you really need a more dense and sturdy cake for a large multi-layered cake like this. The “book” layers were made from an almond-poppyseed muffin recipe that both tasted delicious and withstood the trauma of decorating. 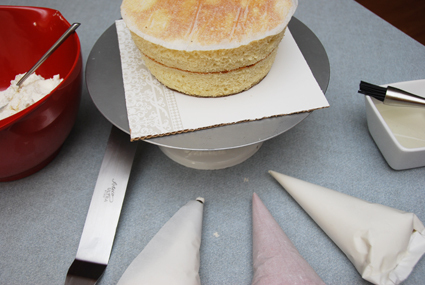 The other layers were made from a very soft white cake recipe that collapsed over time and made the fondant buckle. It was nerve wracking to say the least. My cakes always start as a computer or sketch design where the general proportion and shape is determined. Precision in shaping and trimming the cake to scale, making sure everything even and balanced, really makes a difference. 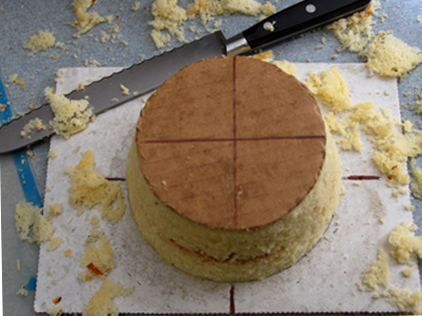 I fashioned my own template to center and trim the cakes evenly. For this particular layer, the top is larger than the bottom, so I cut cardboard rounds for each end and used them as a guide. Trimming the book shapes took some patience. 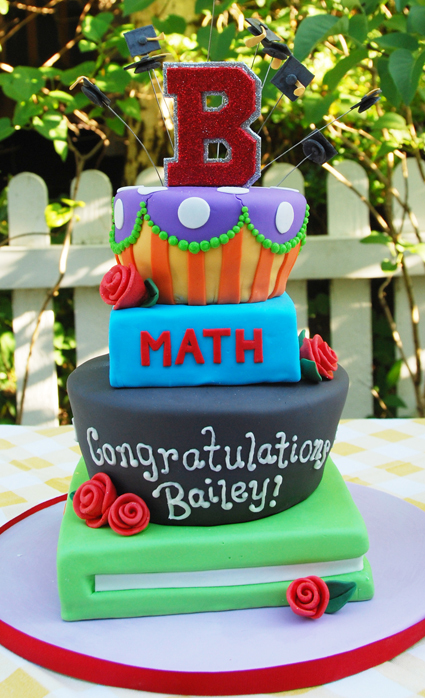 Square cakes are much more difficult to get even than round ones. Lesson #3: Flavors are fun! 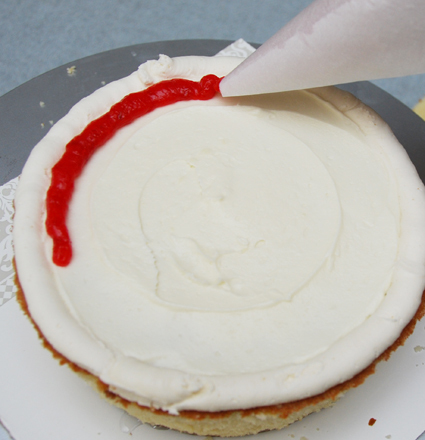 The white cakes were doused with almond-syrup, topped by a cream-cheese frosting followed by a cherry pie filling spread. 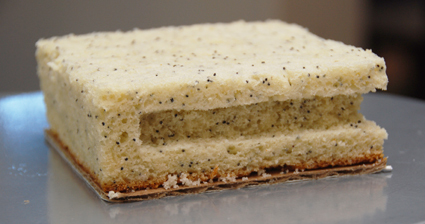 The poppyseed cakes were frosted in a lemon-buttercream frosting that was mouthwatering! Get the recipe here. It’s the best I’ve ever tasted. Here is a closeup of the filling. 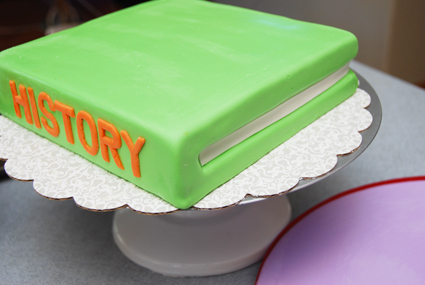 Notice the thick rim of buttercream around the outside edge. This helps to trap in the filling and avoid a bulge in your finish work. Lesson #4: Color! Color! Color! There is no such thing as a food coloring that looks just right on its own. I spent considerable time playing with the color balance in the design process and combined all sorts of shades when coloring the fondant to get an exact match. 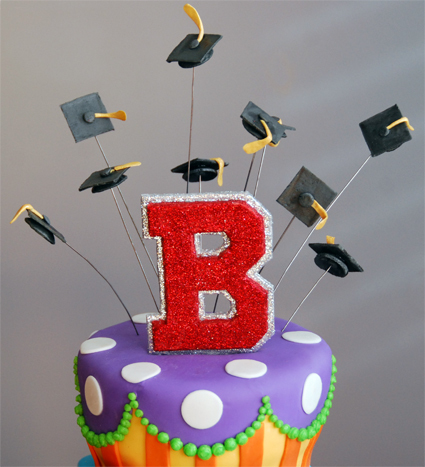 Making the accessory decorations throughout the week made the cake decorating process more relaxing. When it was time to frost and assemble the cake, there was less to worry about. 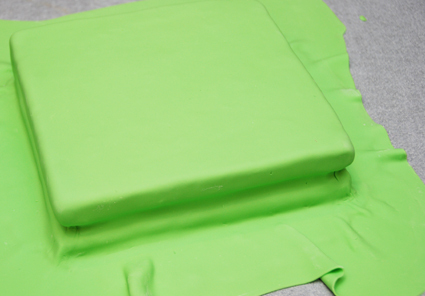 Here is a before and after of covering the book cakes with fondant. This is what they looked like all trimmed and finished with detailed decoration. A very satisfying result! 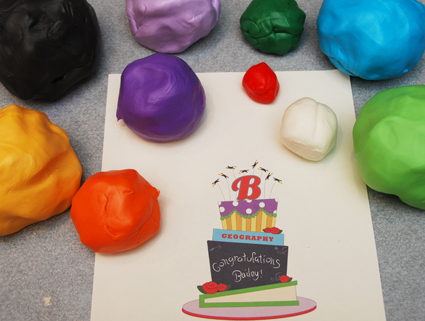 Lesson #6: Gum paste isn’t just for flowers. 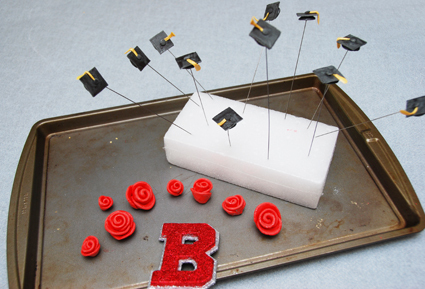 The graduation caps and glitter “B” were all made from gum paste because it dries rock hard and can withstand some abuse without breaking. I end up using it for something on nearly every cake I make. Here’s the cake all finished and on display at the party. It made a great centerpiece for a couple of hours before it was gobbled up. 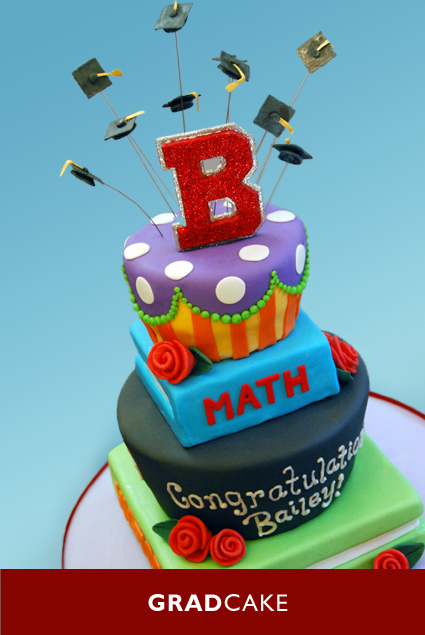 That’s one awesome cake! I love the colour combination!